If you haven't gotten yours to get linked up, go here, to join the party! I'm so ready for summer! This was my first official day of summer vacation and it has rained ALL day. So, today, I'm hoping and dreaming of a warm pool day, hopefully in the near future. I'm also currently living in my three Old Navy "Vintage Tees." If you love a soft worn-in shirts in vibrant colors, they are for you! I currently have three and absolutely love them! Plus, the more you buy the more you save! They look great with khakis shorts and summer skirts... just sayin'. Also, any suggestions for a 3rd/4th grade read aloud book? Even though I'm usually a 5th grade LA/SS teacher, I'm teaching ESL summers school again and have some kiddos back! So I'm trying to do things a little different from last year! I was thinking a Roald Dahl novel perhaps. Last year I read Stone Fox to the kids. I know tons of great 5th grade novels but 3rd grade novels have me stumped! Suggestions please! 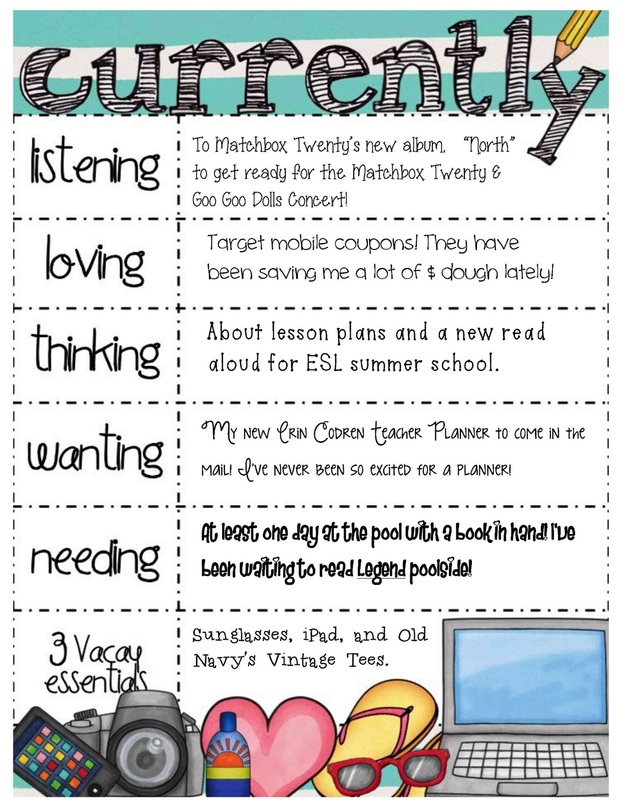 Thanks Oh Boy 4th Grade for providing the template and link-up! I'm a new blogger too!! I found you through Farley's linky party! Wish I was going to that concert with you!! Have a great summer! Stopping by from Farley's currently link up, I am addicted to anything Old Navy and Target, the fact that I have never heard of these Target mobile coupons makes me feel like a bad shopping addict.